Bring family and friends together and have the time of your life with MAMMA MIA! 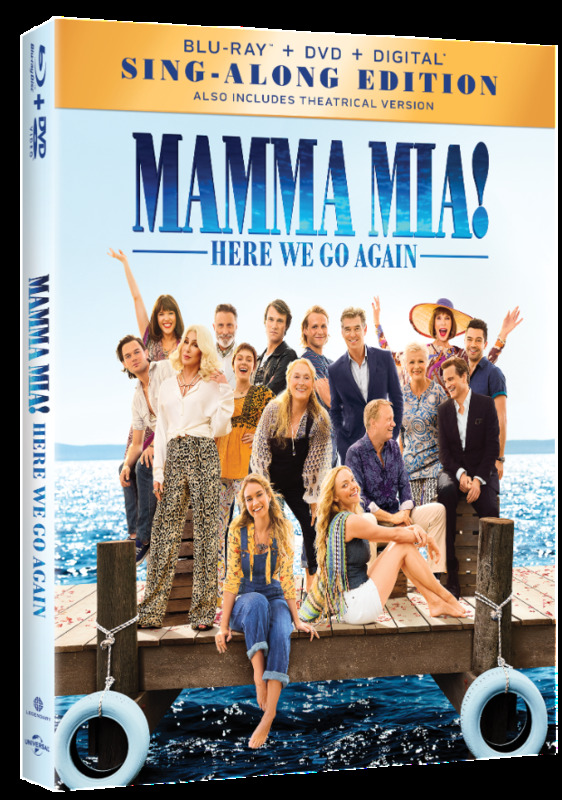 HERE WE GO AGAIN Sing-Along Edition, the all-new smash-hit romantic comedy based on the songs of ABBA, for a one-of-a-kind at home experience. MAMMA MIA! HERE WE GO AGAIN arrives on Digital and the digital movie app MOVIES ANYWHERE on October 9, 2018, as well as on 4K Ultra HD, Blu-rayTM, DVD and On Demand on October 23, 2018 from Universal Pictures Home Entertainment. Ten years after MAMMA MIA! The Movie, MAMMA MIA! HERE WE GO AGAIN invites you to return to the magical Greek island of Kalokairi to continue the story’s emotional journey of family and friendship whilst discovering just how those life-changing relationships were formed and includes hit songs such as When I Kissed The Teacher, Fernando and Dancing Queen. The Story – Producer Judy Craymer reveals how the MAMMA MIA! legacy began, evolved into the first feature film and how she teamed with executive producer/co-story writer Richard Curtis and director/screenplay writer Ol Parker to develop the perfect sequel. MAMMA MIA! Reunited – Focusing on the legacy performers and their excitement at reuniting a decade later, the filmmakers discuss the paths they’ve paved for the characters since we last saw them. Playing Donna – This piece centers on Meryl Streep’s cameo performance and Lily James’ preparation for filling this iconic role. Meeting Cher – The Queen of pop reveals her excitement at joining the MAMMA MIA! family as Ruby Sheridan – Sophie’s glamorous grandmother. Fellow cast members will share their delight at meeting and watching a legend on set. Costumes and The Dynamos – The Young Dynamos have some pretty cool costumes in MAMMA MIA! HERE WE GO AGAIN, and of course so does Cher. And who could forget those trademark dungarees? We will join costume designer Michelle Clapton as she highlights some of her favorite outfits from the movie. Curtain Call – Who can forget the finale to MAMMA MIA! when the cast danced onto cinema screens in full spandex for one final number? Ol Parker has chosen “Super Trouper” to close his movie and it features all 16 key cast members.